ATHERTON, CA Sounds of thundering hoofbeats, clinking wine glasses and laughter harmonized on the polo field at the Menlo Circus Club in Atherton, Calif. on Saturday, May 4th. Roughly 250 people showed up in decadent hats and their spring best to support the Square Peg Foundation at their annual Kentucky Derby fundraiser party. All proceeds went to benefit Square Peg’s adaptive horsemanship program, horse rescue and Autism Family Adventure Camps. Attendees of Square Peg’s Kentucky Derby Fundraiser watch the polo season opener while they wait for the Derby to start. During half time, the well-dressed crowd spilled onto the field for the divot stomp. Hatted heads bobbed around and high-heeled shoes slammed the ground. Announcer, Toby Cooper, said he has “never seen so many people participate in divot stomping before.” Perhaps they were fueled by promises of a bottle of champagne awarded to the divot stomper who successfully located the ball, or, as one spectator suggested, perhaps the crowd’s motivation came from fulfilling their Pretty Woman fantasies. Square Peg beat the Circus Club team after four riveting chukkers. The game was all in good spirit, as several members of the Menlo Polo Club have donated their time and money to the Square Peg Foundation. polo and fashion – how fun is that? While guests dined on the southern inspired menu and sipped wine donated by Derby Vineyards and Mavericks Ales, there were silent auction stands and drawing tickets being sold. Drawing winners would take home a mysterious package that was placed on each table. At around 3 p.m., the Calcutta betting began. The information for each horse racing in the Derby was displayed on three large televisions by the bar. KGO’s Peter Finch and Square Peg’s executive director, Joell Dunlap, engaged the crowd in their presentation of the horses. Square Peg volunteers replaced their breeches and half-chaps with stylish spring dresses and hats. ”I could hardly recognize the ranch volunteers without their horse-clothes and dirt smudges!” said Caryn Marooney, Square Peg client. Square Peg, founded in 2004 by Joell Dunlap, is a non-profit adaptive horsemanship program and horse rescue located in Half Moon Bay, Calif. The foundation is run by a small group of regular volunteers, has 18 horses and caters to about 30 kids per week, who are primarily on the autism spectrum and at risk youth. “Which way would you like to go?” asked Lauren to James, who was seated in front of her on the horse they shared. “This way, or that way?” Lauren pointed left, then right. “That way!” squealed James. With his word, Lauren picked up the canter, and off they went in a cloud of dust and giggles. To the untrained eye, this may look like fun. The untrained eye would be correct. However, some solid neuroscience comes along with this fun. Like horses, children with autism have an overactive amygdala. This is where the stress hormone, cortisol, is released. We need cortisol to live, but too much can cause sensory overload, which is one adverse symptom of autism. Oxytocin, the “feel-good” hormone, is what balances the flood of cortisol. Oxytocin is released by rhythmic rocking of the hips. 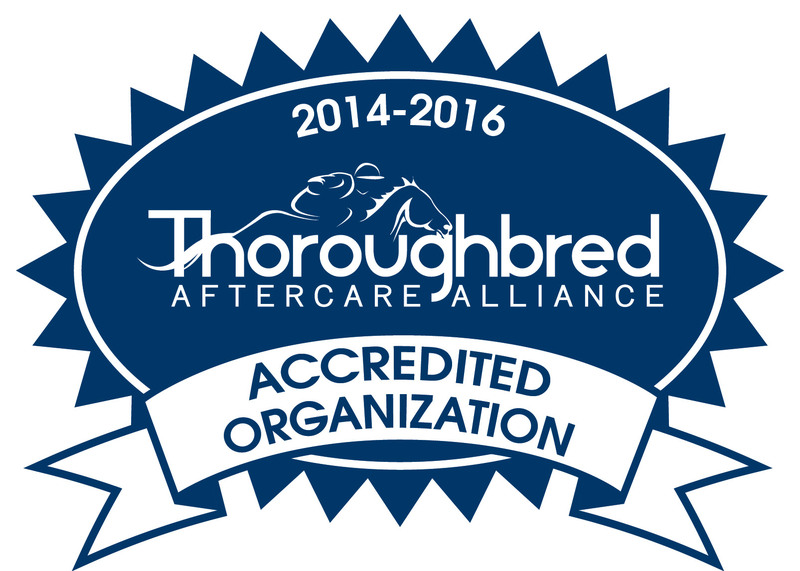 “After our first session at the ranch, we got home and Sylvia was unusually calm. She wasn’t doing her usual repetitive movements. She was just so calm,” said one parent. 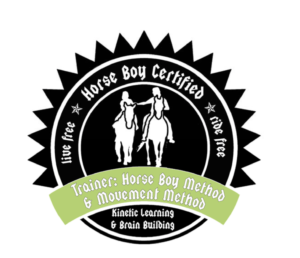 A collected canter rhythmically rocks the hips, thereby flooding the rider with oxytocin. Learning happens when oxytocin is dominant. 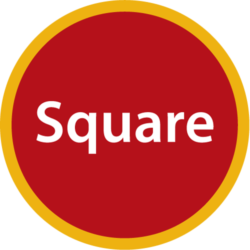 Thus, Square Peg is able to incorporate an educational aspect into the ride. If the child’s interest in riding waxes and wanes, Square Peg listens. 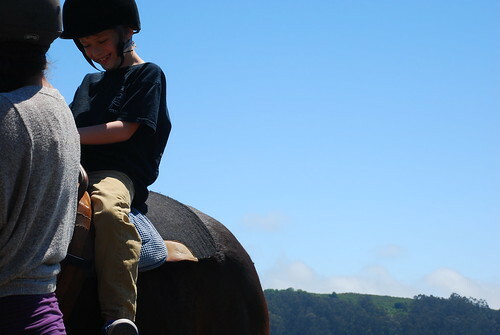 The adaptive nature of the riding program employs a ‘yes’ environment –an environment where self-advocating is the primary goal for the child. 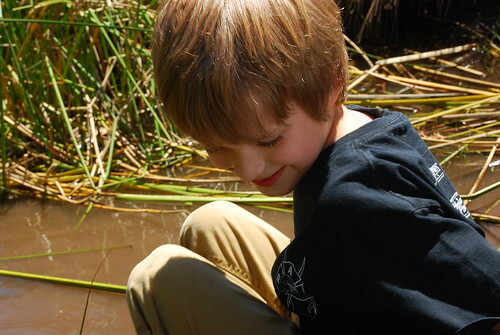 As Joell Dunlap says, “no one changed the world by learning to post the trot.” The ranch encompasses miles of trails, as well as a pond with a small boat, and toys, games and crafts are abundant in the kid’s fort (also known as the helmet room). “It is such a relief to be among people who see his strengths, and do not stand with crossed arms and pursed lips as they view him through eyes narrowed in judgment and disapproval,” says a mom. According to estimates from CDC’s Autism and Developmental Disabilities Monitoring (ADDM) Network, about 1 in 88 children has been identified with an ASD. At Square Peg, most of the children on the Autism spectrum are boys ranging from age 4 to 10. This corresponds with data from the CDC, which suggests that ASDs are almost 5 times more common among boys (1 in 54) than among girls (1 in 252). The horses at Square Peg help children off the autism spectrum as well. Square Peg is kid prioritized, but family oriented. 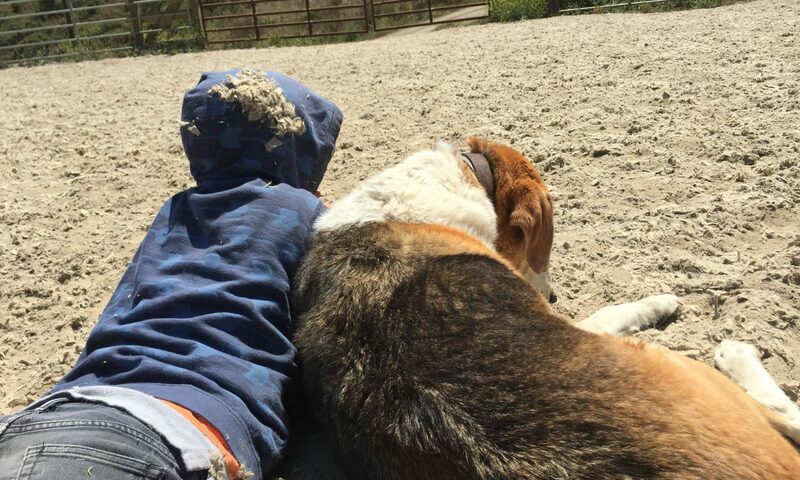 “When a mom brings her 8-year-old son to the ranch to put him on the back of a 1,000 pound animal, one of two things is happening: either she’s in love with horses herself and wants to share that passion with her child, or she’s completely terrified and looking for a miracle,” says Dunlap. After the race, Calcutta winners Jeff and Kate Haas, announced their decision to donate all of their winnings of more than $2,600 to the Square Peg Foundation. “We are overflowing with gratitude for the generosity of our longtime friends,” says Dunlap. 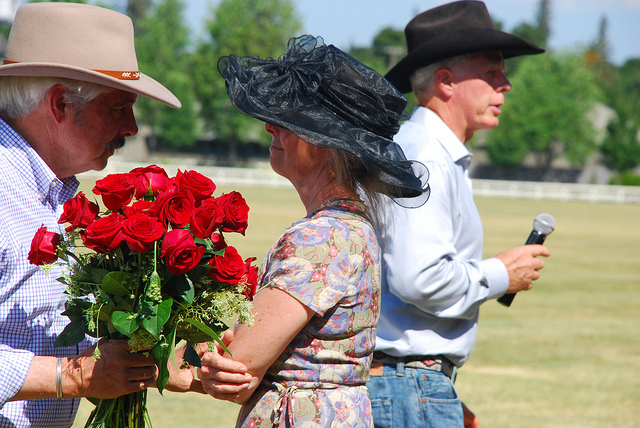 Winners of the calcutta, Jeff (left) and Kate (center) Haas accept congratulatory roses. As the event wound down, the hats removed and the rose arrangements taken off tables, there seemed a peaceful sense of accomplishment. The fundraiser brought in roughly $40k. With double the budget, the Square Peg Foundation will be able to triple their client base. Three times as many children and families will be able to find peace and solace from the magic that horses have to offer. More relationships will blossom on the grounds of love, trust and acceptance amongst members of their community in a place that seems so far away from the chaos of life, yet so close to home. To find out more about the Square Peg Foundation and ways you can help, visit the Square Peg website at www.squarepegfoundation.org. You can also ‘like’ them on Facebook to keep updated with the latest happenings at the ranch.